Before we traveled abroad to Greece & Ghana, Kent State College of Nursing students from Kent and Salem campuses enjoyed a 36-hour layover in Boston, MA. We were free to roam the city and sightsee. After our experience, we created a list of suggestions of things we think you should see and do if you get to travel to Boston, too! 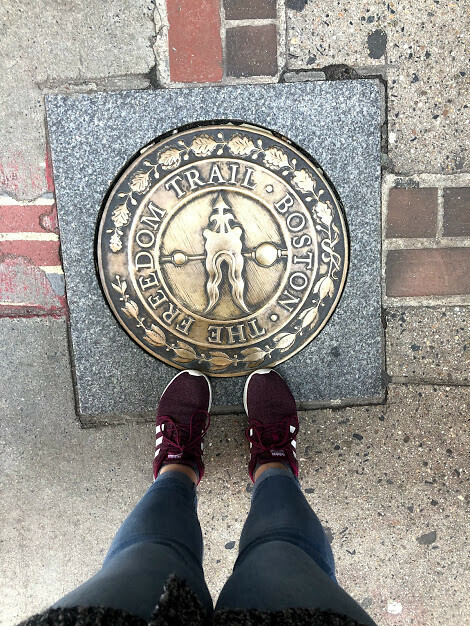 Walk the Freedom Trail! It’s free and takes you to many of the historical sites around the city such as the Paul Revere House, a Holocaust memorial, and various cemeteries. Besides these, we also encourage you to check Boston’s Little Italy, Faneuil Hall, and Quincy Market. There are many shops and local eateries, too, and you may even be able to catch a street performance! Another notable site along the freedom trail is the historical Massachusetts State House, the golden dome definitely catches your attention. If you walk in through the visitors entrance, you are directed to the second floor where you can take a free tour. Every room is elaborately designed, including detailed mosaic floors and vast murals on the ceiling. The state house includes a nurses hall that honors the nurses who served the north during the Civil War. You can also go into the senate house chambers, which was recently renovated. If you are looking to fill your shopping fix, head to Newbury Street! It is lined with plenty of local shops and well-known stores. At the end of the street you will find the Boston Common Park, which reminded us of New York City’s Central Park. This Kent State College of Nursing study abroad experience began in Athens, Greece, where students visited refugee sites and learned about the impact of oppression and social injustice issues on a global level. Students then traveled to Ghana, Africa, where they worked with Willows International Foundation who advocate for women’s reproductive rights and provide healthcare services to those who are least able to utilize healthcare information and services. Students also visited various health care agencies to understand the impact of culture on health care. Both current undergraduate and graduate students were able to apply for this study abroad experience.